There's nothing that Samsung loves more than putting celebrities in its commercials. It's hardly alone in that regard, but some of the recent entries seem to be more about the celebrities than the actual phones. Case in point: the first TV commercial for the Galaxy Note 7 after the initial announcement press blitz. 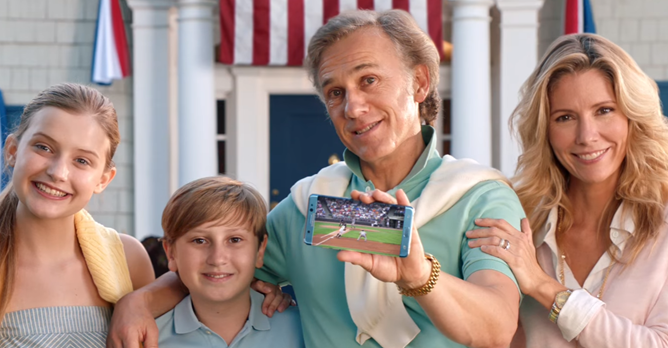 It features Christoph Waltz, Hollywood's current go-to somewhat creepy German-speaking dude, mildly berating Americans so they'll buy the phone. Waltz could stare at the camera for thirty seconds and it would still be entertaining, so watching him shoot through patriotic stereotypes in rapid succession is some goofy fun. But I have to wonder, what's the message supposed to be here? Waltz puts on an air of judgmental European pomposity at the start, ends up won over by God, mom, and apple pie at the end because Americans work so hard and... that makes me want to buy a phone? Which incidentally, comes from a Korean manufacturer? Samsung's commercials tend to run the gamut between cringe-inducing and genuinely entertaining, and I'd say this one fits squarely in the middle. Waltz's charm just about makes up for the bizarre and unfocused premise, and it's always fun to watch an Oscar-winner play dress up for a paycheck. Expect to see it played roughly a million times during the Olympics and the NFL pre-season. If you want to see more Europeans playing dozens of parts at once to sell phones, check out LG's Jason Statham commercial for the G5.